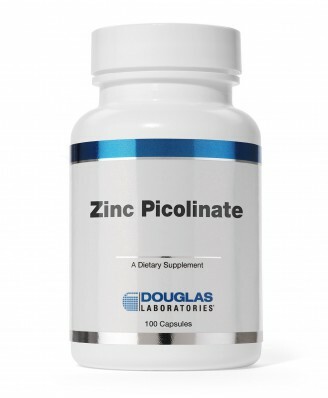 Zinc Picolinate tablets, provided by Douglas Laboratories®, supply bioavailable zinc bound to picolinic acid. Each tablet contains 30 mg zinc, exclusively in the form of zinc picolinate. Zinc Picolinate capsules, provided by Douglas Laboratories®, supplies 30 mg of zinc from zinc picolinate complex. Zinc is an essential trace element involved in most major metabolic pathways. General signs of human zinc deficiency indicate that zinc has important functions in maintaining immune function, reproduction, healthy skin, and growth. Numerous studies support the fundamental role of zinc in normal immune response in humans. Immune cells must be able to rapidly divide in order to respond to daily challenges. Like all rapidly dividing cells, immune cells depend on adequate amounts of dietary zinc. As a cofactor of the antioxidant enzyme superoxide dismutase (SOD), zinc can be considered an antioxidant nutrient. Zinc supplementation has been shown to increase the antioxidant activity of SOD, and provide increased free radical protection. Body cells and tissues are threatened continuously by damage caused by to xic free radicals and reactive oxygen species (e.g., peroxides) which are produced during normal oxygen metabolism, by other chemical reactions, and by toxic agents in the environment. Free radicals, once formed, are capable of disrupting metabolic activit y and cell structure. When this occurs, additional free radicals are produced which, in turn, can result in more extensive damage to cells and tissues. The uncontrolled production of free radicals is thought to be a major contributing factor to oxidative d amage. Zinc deficiency is associated with increased production of free radicals and reactive oxygen species.